In between calls on Friday while skimming my Twitter feed, I stumbled across an interesting announcement, Preview of XenServer support for Docker and Container Management, which led me to, How to Get Started with Container Monitoring on CoreOS. Curious, having seen a brief demo in January, I decided to jump in and see if I could get it running in my lab. Containers are quick and easy, right? First things first, head over to the XenServer Pre-Release Downloads and under the Docker Integration section you’ll need to grab both the supplemental pack and updated XenCenter. Once downloaded, use an SFTP client to copy the ISO onto your XenServer(s) – I’m fond of ForkLift on Mac OS X. You’ll also need to run the XenCenter installer, but its your basic Next, Next, Next ordeal. With the ISO copied onto your XenServer and your XenCenter updated, we’ll start having some fun. Of course, we’re not stopping there, let’s dig deeper and see how the new features look. If, like me, you’re new to CoreOS you’ll want to head to their download page and grab an ISO. While not exactly required, as I’ve learned through additional research, its how I got up and running and works for this “Hello World” example. Don’t forget to copy the ISO to your ISO Storage Repository so we can do some installing. 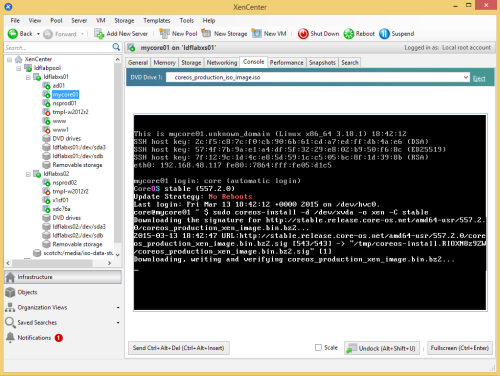 Head over to XenCenter so we can create a new VM. My first pass was pretty much Next, Next, Next (and serves as a learning opportunity). I gave it a name, took the default CPU/Memory/Disk (1 vCPU, 1GB RAM and 5GB disk) and left the Cloud-Config Parameters unchanged. This is important, but I’ll explain why in a second. Make sure to select the new ISO for the installation source and boot the VM when the wizard completes. 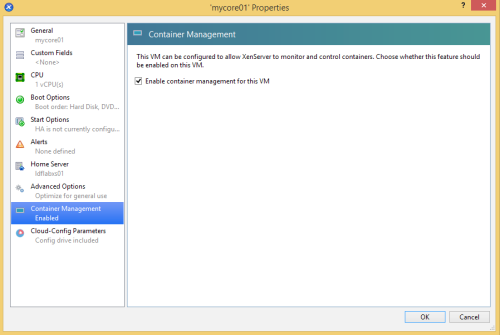 After a quick provisioning, your new VM should be up and running and will automatically boot into the console. You now have a purpose built OS runtime for containers, but what’s next? In order for XenCenter to monitor and control our containers, we need to enable Container Management. 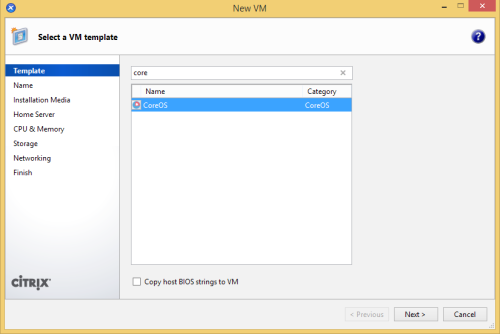 Right-click on the new VM and open its Properties. 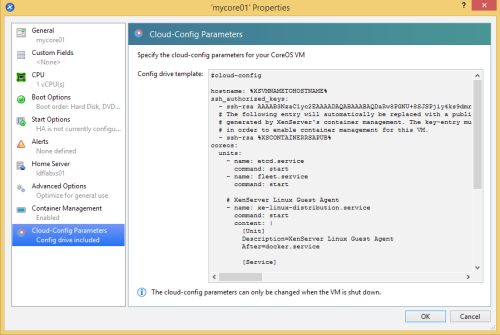 There’s also another set of options called Cloud-Config Parameters. As I mentioned previously, the preview release supports both cloud-config and config-drive, for automated configuration of CoreOS VMs. At some point we’ll want to connect to the VM and actually use it. Assuming you went the Next, Next, Next route and didn’t add your SSH public keys, there’s not much you can do until you rectify the situation (as I learned). We need to revisit the Cloud-Config Parameters and add at least one SSH public key of our own. Now, make sure the VM is shutdown and open the Cloud-Config Parameters again. Paste your public key at the end of the “- ssh-rsa” line, just under the “ssh_authorized_keys:” line. Pay close attention to the comments regarding the %XSCONTAINERRSAPUB% line, its what enables a new daemon in dom0 to monitor/control containers. With those changes complete, you should be able to SSH from your local machine to the CoreOS VM. I elected not to save my passphrase in my Mac’s keychain, hence the error “Saving password to keychain failed”. Flipping back to XenCenter, you should now see the containers grouped under your CoreOS VM. All told, I was able to go from start to finish in about 30 minutes. The XenServer installation was dead simple and getting started with CoreOS/Docker was pretty intuitive. There’s a lot more under the hood to investigate, that’s for sure, so expect more updates in the future (like how do you view/interact with each container, using fleet for container management, etc).